Our lab is multi-site, located within the Psychology Department at National Research University Higher School of Economics (NRU-HSE) in Moscow and within the Psychology Department at York University in Toronto. Our research focuses on creating better understanding on brain-behaviour relations for thoughts, affects and actions across development. A main focus of our work is quantifying changes across cognitive development. 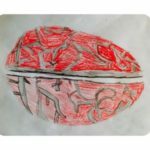 Artwork with permission by young friends of the Neuropsy Lab.